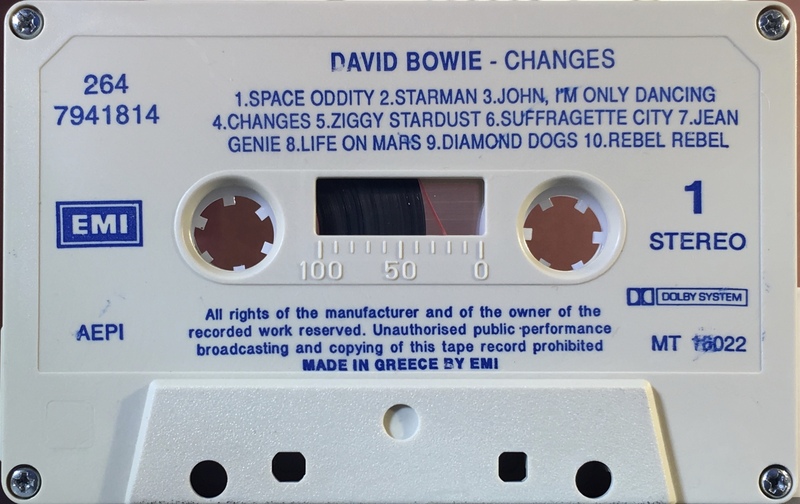 Changesbowie: Greece; EMI, 264-7941814; 1990. Four panel cover on treated, folded card with perforated spine crease and full panel cover photo; inner picture panels; light blue spine and blue rear panel. The inside and inner panels are a pictures collage. The rear of the cover has band and production information. Track list on rear and inner panels. ‘Manufactured and distributed by EMI Greece on rear panel. White ink printed directly to grey shell. Information in Greek and English, AEPI rights and catalogue number MT 16022. The track sequence differs from the original LP in that Young Americans has been moved to the beginning of side 2. Side 1: Space Oddity; Starman; John I’m Only Dancing; Changes; Ziggy Stardust; Suffragette City; Jean Genie; Life On Mars; Diamond Dogs; Rebel Rebel. 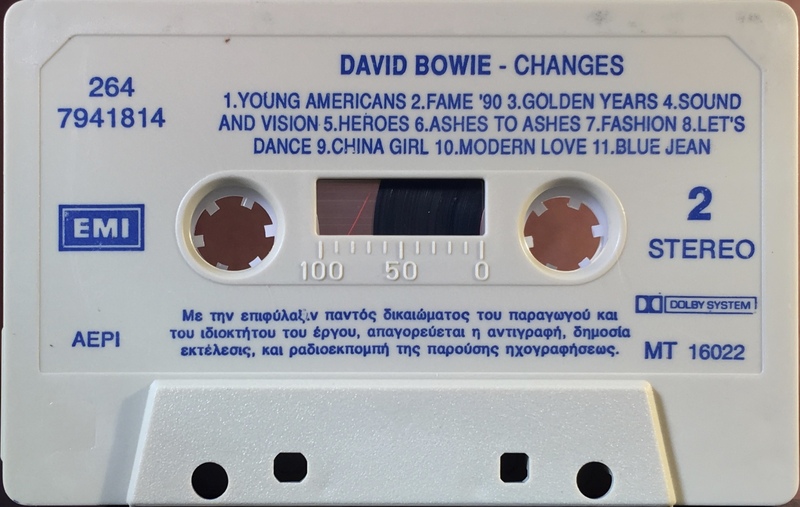 Side 2: Young Americans; Fame ’90 (remix); Golden Years; Sound And Vision; Heroes; Ashes To Ashes; Fashion; Let’s Dance; China Girls; Modern Love; Blue Jean. 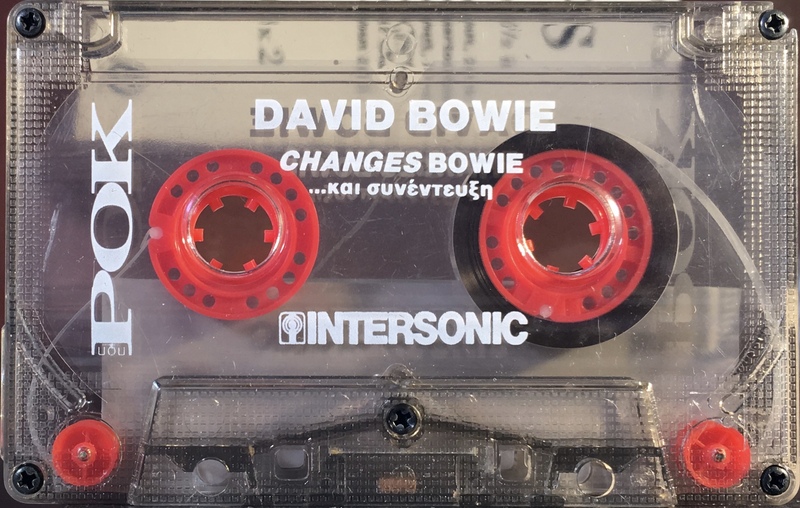 Changesbowie: Greece; Intersonic, no catalogue number; 1990. No cover; this cassette came in a clear cassette case with ΠΟΠ + ΡΟΚ (Pop + Rock), magazine April 1990. White ink printed directly to clear, smoky plastic shell. 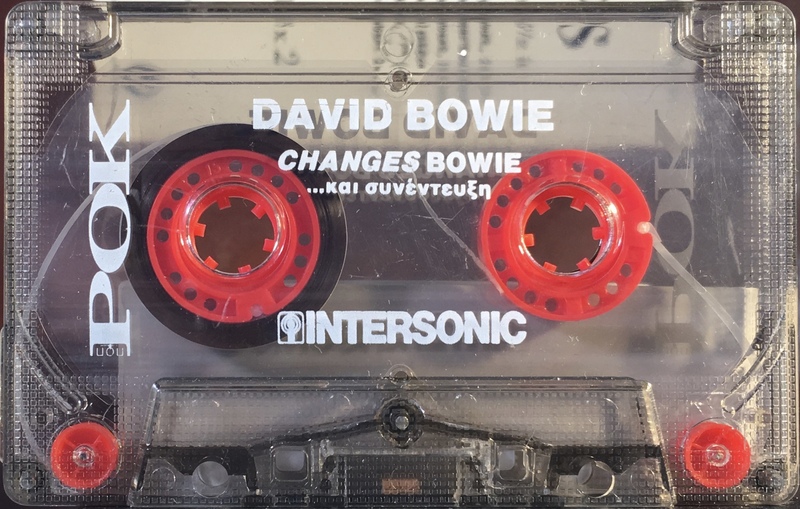 Title shown as ‘Changes Bowie …και συέντευξη’; in English this is ‘Changesbowie…and interview’. Each side of the tape is approximately 5:15 long and is a mixture of song snippets and edited answers to anonymous questions (the interviewer is not heard). There is a short spoken introduction in Greek at the start of Side 1. 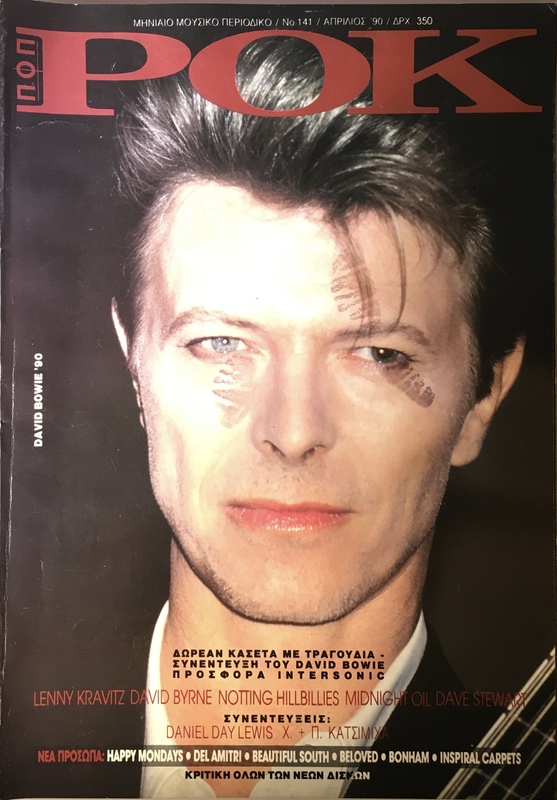 Side 1: Changes; Bowie compares song structure to painting; Ziggy Stardust; Bowie talks about his different working methods in music and film; Jean Genie; Bowie talks about the music he took with him on cassette when filming Merry Christmas Mr Lawrence; Diamond Dogs; Bowie discusses the zeitgeist method of painting. Side 2: Fame ’90 (remix); Bowie talks about changing arts thru the ages’; “Heroes”; Bowie talks about moving to Berlin and the importance of that to his songwriting; Ashes To Ashes; Fashion; Lets Dance; Blue Jean.